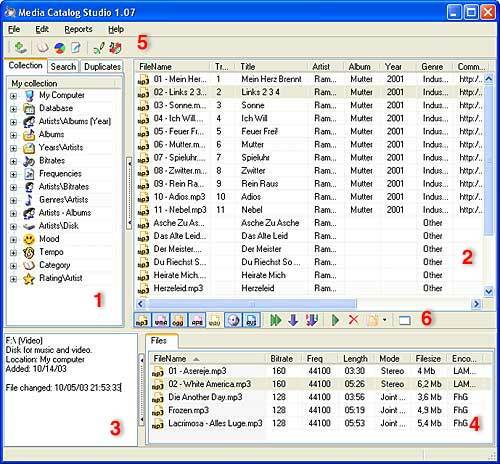 Include three tabs: multimedia collection catalog, files search by entered parameters and duplicates search. Files list displayed if you choose in the main part. Information on the selected disk or file. Toolbar where the files parameters are set; settings for main or temporary files lists. The size of these parts can be changed, or they can be temporarily hidden, by clicking the required button. Additional windows are opened from the menu or the main toolbar. For example, the tag editing window. For the file lists you can change the width of columns, their order, or just hide the unnecessary information. This can be done when you open the pop-up menu of lists headlines. During the lengthy operations such as receiving information from the database, a window appears showing the progress of operation and estimated time of its completion. Besides, if you refer to the database in the right bottom-hand corner of the status bar the word “Query” is displayed. During this time it is recommended not to open menus or click button keys on the toolbar.